We want to thank Rob Coates for the short but informative user review of the LCT 840 tube microphone on gearslutz.com. "First off, the mic and power supply come in a large, heavy, impressive looking black case. The case is the size of a small suitcase. The mic and power supply have a very modern design and look. The tube, is visible through a little window on the front of the mic. [...] The shock mount for the mic is very sturdy and well designed. Largest shock mount for a mic I've ever seen but it's very easy to set up. The mic itself is fairly heavy so a larger, sturdy stand is recommended. OK, how does it sound? In a word, fantastic. Warmest, smoothest, tube mic I've ever used. I do a lot of vintage type stuff like bluegrass, vintage country etc. 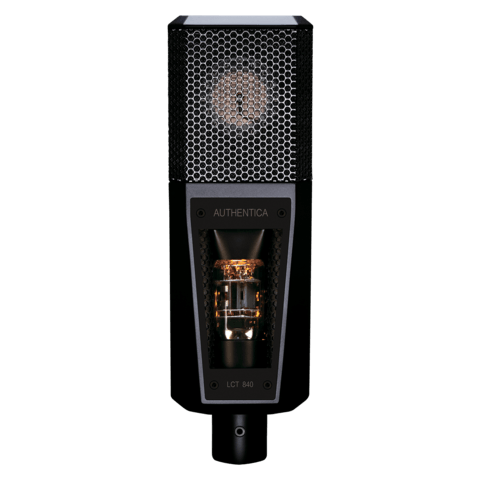 The LCT 840 is perfect for vocals for a vintage vocal sound. No hype on the high end. No muddyness on the low end. Just a perfectly balanced albeit warm and somewhat dark sound. Running through a tube/transformer preamp results in vintage sound dripping with warmth and mojo. The Good: Looks good and sounds even better. Perfect for vintage vocal sounds. The bad: The large heavy case is overkill. The back lit tube visible through a window looks gimicky."